The Department of Microbiology was established in June 1996 and Post Graduate course (M.Sc. Microbiology) commenced from July 2002. The college also has a recognized Research Centre for M.Phil. and Ph.D. in Microbiology. The department is sponsored by DBT, Govt. of India under STAR College Scheme and by DST, Govt. of India under FIST initiative. Recognized Research Centre for M.Phil and Ph.D in Microbiology. students: 'Applied Techniques in Industry and Laboratories' started in academic year (2012-13). Applied Techniques in Industry and Laboratories” was started in June 2012. The syllabus for the same was approved by University of Pune. Eleven students of T.Y.B.Sc Microbiology opted for this course in year 2016-17. The objectives of this course are to bridge the gap between academia and industry, to impart career and market oriented training, to impart soft skills and entrepreneurship skills and to empower students and increase their employability. An MOU was signed with Janakalyan Blood Bank and Kulkarni Laboratories and Quality Management Services for training of students. Students will receive a certificate on completion of required credits. Placement assistance will be offered to the students under this course. 1 Placement Workshop "Right Groundwork For Right Industry" conducted in collaboration with the Board of Student Welfare, University of Pune. 1 Certificate Course: "Applied Techniques in Industry and Laboratories". Functioning of Dairy, Winery, Sugar factory & Green/ Poly house. SYBSc & TYBSc students visited Urja (Kutwal Foods) on 22/08/14 and MSc II visited it on 20/08/14 where they were shown Dairy and Mineral Water Plant functioning. TYBSc students visited NARI on 2/12/14, their open day. TYBSc students visited Janakalyan Rakta Pedhi, Pune on 30th Jan 2015. TYBSc students visited Parle G factory and Kamdhenu Masale factory on 2/01/15 where they were shown Functioning of the factories, Process of making Biscuits, spices and pickles – as part of UGC-Career Oriented Course. MSc I students visited MCC-NCCS where they saw various instruments (for which the working was explained) such as FAME Analyzer, MALDI- TOF, Automated Sequencers on 25/09/14. 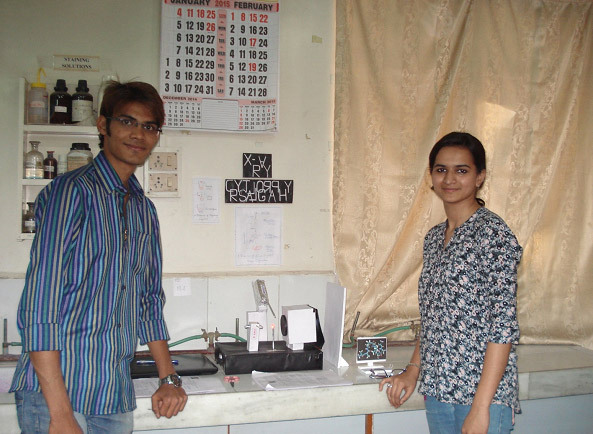 M.Sc.-I on 13/02/15 visited Agharkar Research Institute to see Anaerobic glove box, Gassing manifold, Gas chromatography. MSc I students on 28/02/15 visited NCCS (Open Day) to see Confocal Microscopy. MSc I students on 7/03/15 saw how to carry out Plant Virus Infectivity Assay at Indian Agricultural Research Institute (Regional Centre), Baner, Pune. MSc II students visited NCCS on 22/08/14 where they were given a demonstration of FACS. MSc II students visited PMC's Sewage treatment plant at Dr. Naidu Hospital Pune on 13/10/14. Dr. Yogesh Shouche, Scientist G, MCC-NCCS delivered a lecture on 'Next Generation Sequencing' on 25/09/14 for MSc I students at MCC-NCCS. Dr. Ravindra Kshirsagar, Assistant Prof., Zoology, MCASC, GK conducted a lecture for MSc I students on 10/10/14 on 'Developmental stages of frog and Drosophila'. Dr. Dheeraj Dhotre, MCC-NCCS conducted lecture and Practicals for MSc II students on 13/08/14 (Lect), 26/08/14 (Prac) & 27/08/14 (Prac) on 'Gene Annotation'. 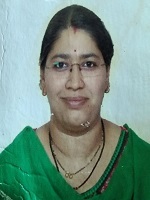 Dr. Sudha Gangal, ex –Professor, Rajiv Gandhi Inst. Of Biotechnology conducted a lecture 'Cancer Immunology' on 27/8/14 for MSc II students. Mr. Prateek Katekar, Microbiologist, Venky's conducted a practical on 'Cultivation of chick embryo' for MSc II students on 16/09/14. Sougata Ghosh, PhD student, IBB, Pune MSc- I & II delivered a lecture on 'Analytical phytochemistry of pharmaceutically important medicinal plants on 31/01/15 for MSc students. 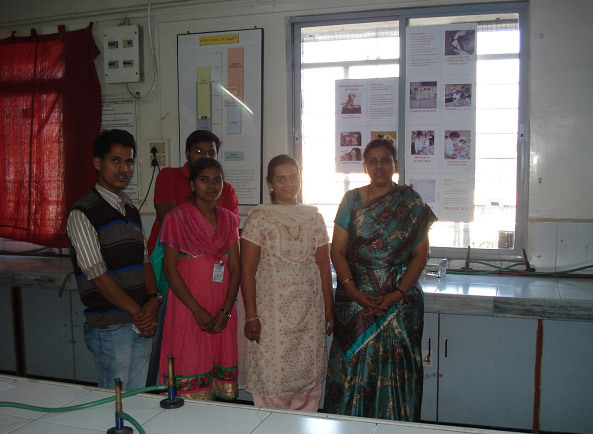 Dr. Leena Yeolekar, Consultant, Serum Institute of India Ltd., Pune conducted a demonstration practical on 'Egg Inoculation Technique', for TYBSc & MSc-I students on 03/02/15. 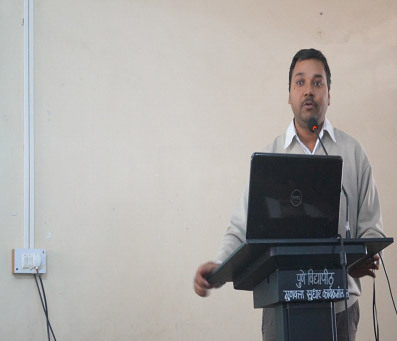 Dr. Sandeep Srivastava (Assistant Prof., Dept. 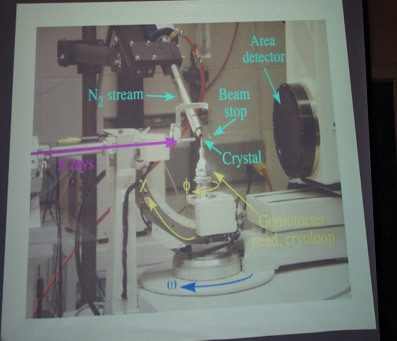 of Bioscience and Technology, DIAT, Pune): Protein Crystallography : What Does 3D Tell Us? Participated in and won 1st prize for poster presented at International Conference on 'Application of Advanced Technology for Enhancing Quality of Science Education', organized by Dept. of Microbiology, Modern College of Arts, Science & Commerce, Shivajinagar, Pune-5 on 26/02/15 and 27/02/15. Participated and presented a poster at National Conference on 'Dynamic Microbes: Role in Human Welfare', organized by Dept. 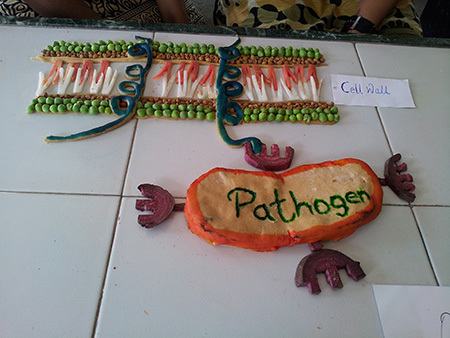 of Microbiology, Modern College of Arts, Science & Commerce, Shivajinagar, Pune-5 on 20/02/15 and 21/02/15. Completed Faculty Development Programme for Senior Faculty of Science (Microbiology) at Modern College of Arts, Science and Commerce, Shivajinagar, Pune-05, from 2/ 06/ 2014 to 8/06/14 under the auspices of UGC-Academic Staff College, Pune. Completed Faculty training program, 'Unleashing Potential for Personal Effectiveness', organized by Staff Academy of Moden College, Ganeshkhind in association with Institute of Education, Training & Research, Pune on 12/07/14 & 13/07/14. Organized and attended symposium on "Entrepreneurship: A Gateway for Biologists 2014" organized by AMI Pune unit, and Dept. 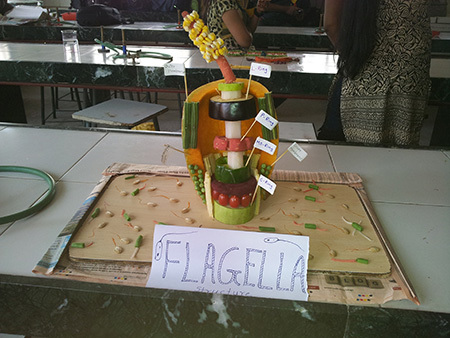 of Microbiology, DES Fergusson College, Pune in 30/09/14. Attended SYBSc Microbiology syllabus revision meeting of Bharati Vidyapeeth Deemed University at Y.M. College, Erandwane in Aug 2014. Election Duty (Polling Officer 1) on 15/10/2014. Attended training for the same on 28/09/14, 9/10/14 & 14/10/14. Life member of Association of Microbiologists India. Life member of Society of Biological Chemists (India). 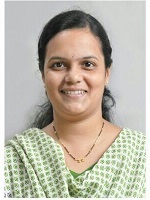 Executive Council member of Association of Microbiologists India (Pune unit). Attended symposium on "Entrepreneurship: A Gateway for Biologists 2014" organized by AMI Pune unit, and Dept. 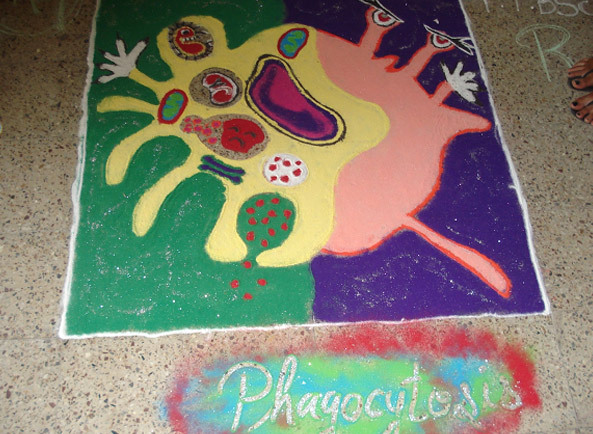 of Microbiology, DES Fergusson College, Pune in 30/09/14. Worked as a member of 'Salad decoration and bouquet competition committee' during youth week. 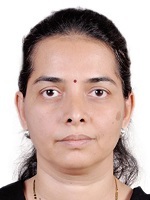 Chairperson: NAAC criterion III Committee. Attended a workshop on "Scientific Writing For Teachers " conducted by Zoology department Modern college Ganeshkhind on 21/02/15. Attended a workshop on "M.Sc. II syllabus restructuring and discussion " conducted by T.C. College Baramati . Co-coordinator for Certificate Course: "Applied Techniques in Industry and Laboratories". Coordinator for Certificate Course: "Applied Techniques in Industry and Laboratories". Worked as a member of 'Elocution competition committee' during youth week. Attended M.Sc II CAP At Modern College, Shivajinagar. Co- ordinator for "Safety, Health & Environment" Committee. >Life member of Association of Microbiologists India. Member of "Placement Cell" Committee. Organised "Industry Connect" a programme under Placement Committee for all streams in our college. Organised workshop "Right Groundwork for Right Industry" under the aegis of Board of Students Welfare. Member of "Safety, Health & Environment" Committee. Coordinator for "Water Potability Testing" Programme for drinking water provided in college. Incharge " Yuva Saptah Inauguration" Committee. Member of "Science Exhibition "Committee (Departmental Level). College Coordinator "State Level Microbiology Contest" conducted by R. C. Patel, College; Shirpur. Attended a workshop on "Scientific Writing For Teachers " conducted under DBT STAR college scheme by Zoology department Modern college Ganeshkhind on 21/02/15. Attended a workshop on "Scientific Writing For Teachers" conducted under DBT STAR college scheme by Zoology department Modern college Ganeshkhind on 21/02/15. Ghosh, S., More, P., Jagtap, S., Chopade, B. A. (2013). Synthesis of novel copper nanoparticles with alpha amylase inhibitory activity by Dioscorea bulbifera tuber extract. Ghosh, S., Jagtap, S., More, P., Chopade, B. A. (2013) A process for synthesis of bimetallic AucoreAgshell nanoparticles by tuber extract of a medicinal plant called Dioscorea bulbifera. Salunke, G., Ghosh, S., Chopade, B. A. (2014) Innovative process for synthesizing Au/Ag bimetallic nanoparticles synthesized from Plumbago zeylanica. Ghosh S, Harke AN, Chacko MJ, Gurav SP. (2016) Gloriosa superba mediated synthesis of silver and gold nanoparticles. Ghosh S, Gurav SP, Harke AN, Chacko MJ. (2016) An optimized process for Dioscorea oppositifolia mediated synthesis of gold and silver nanoparticles. Ghosh S, Chacko MJ, Gurav SP, Harke AN. (2016) Process optimization for synthesis of silver and gold nanoparticles using Barleria prionitis leaf. Ghosh S, Gurav SP, Harke AN, Chacko MJ, , Joshi KA, Dhepe A, Charolkar C, Shinde VS, Kitture R, Parihar VS, Banerjee K, Kamble N, Bellare J, Chopade BA (2016) Dioscorea oppositifolia mediated synthesis of gold and silver nanoparticles with catalytic activity. Journal of Nanomedicine and Nanotechnology. 7:5. Ghosh S, Chacko MJ, Harke AN, Gurav SP, Joshi KA, Dhepe A, Kulkarni AS, Shinde VS, Parihar VS, Asok A, Banerjee K, Kamble N, Bellare J, Chopade BA (2016) Barleria prionitis leaf mediated synthesis of silver and gold nanocatalysts. Journal of Nanomedicine and Nanotechnology. 7:4. Ghosh S., Harke A.N., Chacko M. J., Gurav S.P., Joshi K.A., Dhepe A., Dewle A., Tomar G.B., Kitture R., Parihar V.S., Banerjee K., Kamble N., Bellare J., Chopade B.A. (2016) Gloriosa superba mediated synthesis of silver and gold nanoparticles for anticancer applications. Journal of Nanomedicine and Nanotechnology. 7:4. Ghosh, S., Patil, S., Chopade, N.B., Luikham, S., Kitture, R., Gurav, D.D., Patil, A.B., Phadatare, S. D., Sontakke, V., Kale, S., Shinde, V., Bellare, J., Chopade, B.A. (2016) Gnidia glauca leaf and stem extract mediated synthesis of gold nanocatalysts with free radical scavenging potential. Journal of Nanomedicine and Nanotechnology. 7:2. Ghosh, S., Parihar, V. S., Dhavale, D. D., Chopade, B. A. (2015) Commentary on therapeutic potential of Gnidia glauca: A novel medicinal plant. Medicinal Chemistry. 5(8):351-353. Ghosh, S., Jagtap, S., More, P., Shete, U. J., Maheshwari, N. O., Rao, S. J., Kitture, R., Kale, S., Bellare, J., Patil, S., Pal, J. K., Chopade, B. A. (2015) Dioscorea bulbifera mediated synthesis of novel AucoreAgshell nanoparticles with potent antibiofilm and antileishmanial activity. Journal of Nanomaterials. 2015: Article ID 562938. Ghosh, S., Nitnavare, R., Dewle, A., Tomar, G.B., Chippalkatti, R., More, P., Kitture, R., Kale, S., Bellare, J., Chopade, B.A. (2015) Novel platinum-palladium bimetallic nanoparticles synthesized by Dioscorea bulbifera : Anticancer and antioxidant activities. International Journal of Nanomedicine.10:1- 4. Ogale S, Patel M, Tank J (2015) Anti-microbial potential of plant extracts againt multi-drug resistant uropathogens. Int.J.Curr.Microbiol.App.Sci. 2: 222-239. 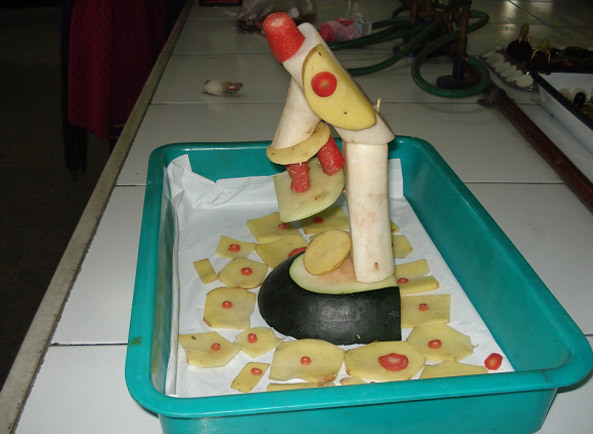 Sonawane A, Mahajan M, Renake S (2015) Antifungal activity of a fungal isolates against pomegranate wilt pathogen Fusarium. Int.J.Curr. Microbiol.App.Sci. 2: 48-57. Modi - Parekh K, Bhat A, Joshi P. (2015) Plasmid profiling of multidrug resistant isolates of E. coli, Klebsiella and Pseudomonas and antimicrobial potential of Allium sativum L. (garlic) against these isolates. Int.J.Curr.Microbiol.App.Sci. 2: 163-171. Satbhai A, Kasodekar A, Pachuau L, Bharambe N (2015) Isolation of halophiles from the Dead Sea and exploring their potential biotechnological applications. Int.J.Curr.Microbiol.App.Sci. 2: 1-17. Dande V, Sonawane A, Goradiya S, Ghule A, Mahajan M, Renake S (2015) A study of a unique herbal elixir as a potential green pesticide for integrated pest management of pomegranate. Int. J. Curr. Microbiol. App. Sci. 2: 388-398. Kulkarni N, Ogale S (2015) ICT in Higher Education: A case study. Dnyanmay. 1: 50-54. Sunder AV, Kumar A, Naik N, Pundle AV (2012) Characterization of a new Bacillus cereus ATUAVP1846 strain producing penicillin V acylase, and optimization of fermentation parameters. Ann Microbiol. 62(3):1287–1293. Ghosh S and Chopade B.A. (2016) AucoreAgshell Nanoparticles with potent antibiofilm activity as novel nanomedicine. 5th International Conference on Pathology, 9th to 11th May, Chicago, IL, USA. Ogale S, Nalawade S, Mulla K (2016) Bioprospecting of endophytes from indigenous medicinal plants for plant growth promoting activities and biotechnological applications. Proceedings of Innovative Trends in Chemical, Physical and BioSciences (ITCPB-2016), 9th and 10th February, 2016 at Annasaheb Magar Mahavidyalaya, Pune. Abstract published in e-Proceedings with ISBN-978-93-84659-28-8. Kulkarni N, Patil Y, Sahasrabuddhe G (2016) Screening of Actinomycetes for production of anticancer enzyme L- asparginase. Proceedings of Innovative Trends in Chemical, Physical and BioSciences (ITCPB-2016), 9th and 10th February, 2016 at Annasaheb Magar Mahavidyalaya, Pune. Abstract published in e-Proceedings with ISBN-978-93-84659-28-8. Karkhanis A and Tukdeo M (2016) Bioconversion of glycerol into value added compounds by bacteria: production of polyhydroxyalkanoate. Innovative Trends in Chemical, Physical and BioSciences (ITCPB-2016), 9th and 10th February, 2016 at Annasaheb Magar Mahavidyalaya, Pune. Ghosh S., Derle A., Kitture R., Kale S.N., Chopade B.A. (2016) Promising magnetic nanoparticles functionalized with diosgenin inducing apoptosis against breast cancer. 26th to 28th February, 2016. A conference of new ideas in cancer – Challenging dogmas, Tata Theatre, National Centre of Performing Arts, Mumbai. (Poster presentation) pp. 66. Luikham S, Ghosh S and Chopade B.A. (2016) AucoreAgshell Nanoparticles with potent antibiofilm activity as novel nanomedicine. International Conference on Nanotechnology for better living. 25th May to 29th May, 2016 NIT Srinagar and IIT Kanpur, Srinagar, India. Luikham S., Jadhav S.P., Sawant H.S., Ogale S.S., Ghosh S. (2016) Antimicrobial synergy and antidiabetic activity of Litchi chinensis peel extracts. 22nd and 23rd January, 2016. Faunal Diversity: Assessment and Conservation (FDAC-2016). Modern College of Arts, Science and Commerce, Ganeshkhind, Pune. Kulkarni A, Kumbhare S, Dhotre D, Shouche. (2015) A computational exercise to determine the core gut microbiota of an Indian subpopulation and its imputed metagenomics. 7th – 10th December, 2015. 56th Annual Conference of Association of Microbiologists of India (AMI-2015) & International Symposium on “Emerging Discoveries in Microbiology” at Convention Center, JNU, New Delhi, India. Ghosh S., More P., Kitture R., Kale S., Bellare J., Chopade B.A. (2015) Diosgenin functionalized magnetic nanoparticles as novel apoptotic inducers against breast cancer. 1st to 4th December, 2015. Third international conference on nanotechnology for biological and biomedical applications (Nano-Bio-Med 2015), Indian Institute of Technology (IIT Bombay), Mumbai, India. (Oral presentation-Contributory talk). Physics, University of Pune, Pune. (Poster presentation) pp. 85. Kothari AJ, Patwardhan CN, Nimonkar Y, Vani P, Prakash O, Parekh K (2015) Study of bacterial diversity from a dairy effluent treatment plant. 20th and 21st February, 2015. National Conference on Dynamic Microbes: Role in Human Welfare, Modern College of Arts, Science and Commerce, Shivajinagar, Pune – 411005, Maharashtra, India. pp. 1. Teggi AA, Gandhi KS, Satpute SK, Banpurkar AG (2015) Probiotic bacterium SPPU1 as a potential source for biosurfactant production having biomedical prospective. 20th and 21st February, 2015. National Conference on Dynamic Microbes: Role in Human Welfare, Modern College of Arts, Science and Commerce, Shivajinagar, Pune – 411005, Maharashtra, India. pp. 3. Sonawane A, Renake S, Mahajan M. (2015) Antifungal activity of Trichoderma and fungal isolates F1, F5, F6 against pomegranate wilt pathogen Fusarium. 20th and 21st February, 2015. National Conference on Dynamic Microbes: Role in Human Welfare, Modern College of Arts, Science and Commerce, Shivajinagar, Pune – 411005, Maharashtra, India. pp. 6. Satbhai A, Pachuau L. (2015) Isolation and screening of PHB producing halophiles from dead sea. 20th and 21st February, 2015. National Conference on Dynamic Microbes: Role in Human Welfare, Modern College of Arts, Science and Commerce, Shivajinagar, Pune – 411005, Maharashtra, India. pp. 9. Modi - Parekh K, Bhat A, Joshi P. (2015) Plasmid profiling of multidrug resistant isolates of E. coli, Klebsiella and Pseudomonas and antimicrobial potential of Allium sativum L. (garlic) against these isolates. 20th and 21st February, 2015. National Conference on Dynamic Microbes: Role in Human Welfare, Modern College of Arts, Science and Commerce, Shivajinagar, Pune – 411005, Maharashtra, India. pp. 17. Mestry N, Limbachiya S, Rahi P, Shouche Y (2015) Molecular identification and phylogenetic analysis of fenugreek root-nodulating bacteria. 20th and 21st February, 2015. National Conference on Dynamic Microbes: Role in Human Welfare, Modern College of Arts, Science and Commerce, Shivajinagar, Pune – 411005, Maharashtra, India. pp. 23. Ogale S, Patel M, Tank J (2015) Bioactivity of plant extracts against multi-drug resistant uropathogens. 20th and 21st February, 2015. National Conference on Dynamic Microbes: Role in Human Welfare, Modern College of Arts, Science and Commerce, Shivajinagar, Pune – 411005, Maharashtra, India. pp. 23. Dande V, Sonawane A, Goradiya S, Ghule A, Mahajan M, Renake S (2015) ‘Harit sanjivani’ – A potential green pesticide for integrated pest management of pomegranate. 20th and 21st February, 2015. National Conference on Dynamic Microbes: Role in Human Welfare, Modern College of Arts, Science and Commerce, Shivajinagar, Pune – 411005, Maharashtra, India. pp. 39. Gandhi KS, Teggi AA, Satpute SK, Banpurkar AG (2015) Probiotic bacteria as a promising source for biosurfactant with antimicrobial and antibiofilm potential. Raman Memorial Conference. 13th and 14th February, 2015. 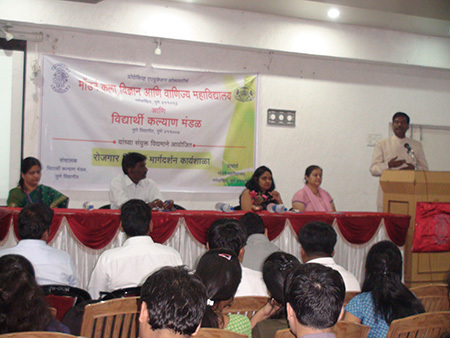 Raman Memorial Conference, Savitribai Phule Pune University, Pune – 411007, Maharashtra, India. Ogale S and Kulkarni N (2015) Use of ICT in higher education. International Conference on Application of Advancet Technology for Enhancing Quality of Scientific Education. 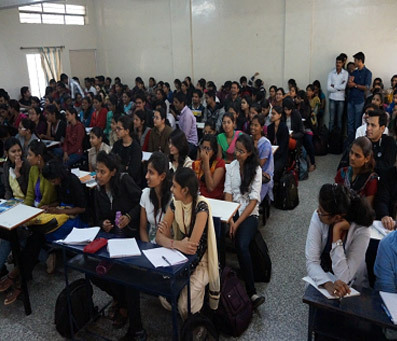 Modern College of Arts, Science and Commerce, Shivajinagar, Pune – 411005, Maharashtra, India. pp. 40. Chitalange P, Kulkarni M, Ogale S. (2012) Characterization of uropathogens and screening of herbal extracts for their antibacterial activity. 24th -25th February, 2012. Second National Conference on Biotechnology, Bioinformatics and Bioengineering Organized by Society of Applied Biotechnology, Kolhapur Maharashtra, India (Poster presentation) pp. 52. Thorat A, Hagir D, Dande V. (2011) Isolation, characterization and study of virulence factors of bacterial pathogen causing blight of pomegranate. 6th - 9th February, 2011. Biotechnology for Better Tomorrow (BTBT-2011) organized by The Department of Microbiology, Dr. Babasaheb Ambedkar Marathwada University, Osmanabad, Maharashtra, India (Poster presentation) pp. 89. Wani M, Girme M, Satbhai A. (2011) Isolation of halophiles from the dead sea sample and studying their potential commercial application. 6th - 9th February, 2011. 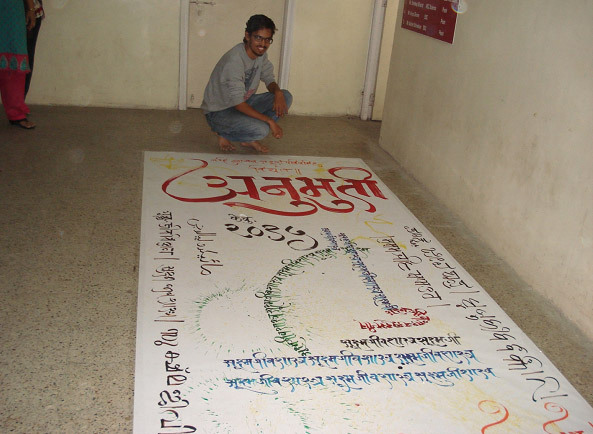 Biotechnology for Better Tomorrow (BTBT-2011) organized by The Department of Microbiology, Dr. Babasaheb Ambedkar Marathwada University, Osmanabad, Maharashtra, India (Poster presentation) pp. 157. Paul S, Panaskar A, Ogale S. (2011) Microbial diversity of a soil sample from Mumbai coastal area. 6th - 9th February, 2011. Biotechnology for Better Tomorrow (BTBT-2011) organized by The Department of Microbiology, Dr. Babasaheb Ambedkar Marathwada University, Osmanabad, Maharashtra, India (Poster presentation) pp. 162. Manani R, Manani R, Chaugule BB, Dande V. (2012) Biosynthesis of silver nanoparticles from microalga and cyanobacteria. 28th – 30th January, 2012. International Conference on Business Opportunities in Life Sciences organized by Modern College of Arts, Science and Commerce, Shivajinagar, Pune – 411005, Maharashtra, India (Poster Presentation) pp. 29. Pawar S, Mirajkar S, Sonawane S, Kulkarni N. (2012) Screening and media optimization of nucleases using Actinomycetes. 28th – 30th January, 2012. International Conference on Business Opportunities in Life Sciences organized by Modern College of Arts, Science and Commerce, Shivajinagar, Pune – 411005, Maharashtra, India (Poster Presentation) pp. 38. Verma R, Lahare P, Dande V. (2012) Antibacterial activity of medicinal plants against Xanthomonas axonopodis pv punicae causing bacterial blight of pomegranate. 28th – 30th January, 2012. International Conference on Business Opportunities in Life Sciences organized by Modern College of Arts, Science and Commerce, Shivajinagar, Pune – 411005, Maharashtra, India (Poster Presentation) pp. 39. Gawade D, Joshi B, Lad D, Pawale B, Parekh K. (2012) Antibacterial potential of common herbal preparations and plasmid profiling of multidrug resistant isolates of Pseudomonas aeruginosa. 28th – 30th January, 2012. International Conference on Business Opportunities in Life Sciences organized by Modern College of Arts, Science and Commerce, Shivajinagar, Pune – 411005, Maharashtra, India (Poster Presentation) pp. 39. Microbial Diversity Assessment of River water sample’. Module: Blood Banking Techniques and Haematology. Microbial diversity, DNA sequencing, Next Generation DNA Sequencing. Vaintey Chem Products Pvt. Ltd.
Placement Workshop “Right Groundwork For Right Industry” conducted in collaboration with the Board of Student Welfare, University of Pune. Anaerobic bacteria culturing facility, Agharkar Research Institute, Pune. Dr. Absar Ahmad, Senior Principal Scientist at Biochemical Sciences Division, NCL, Pune had delivered a lecture on “Synthesis of nanoparticles using microorganisms and its applications” on 06/02/15 for M.Sc. II, MSc I, TY B.Sc. students in Microbiology, Dept, MCASC, GK. Dr. Yogesh Shouche, Scientist G, MCC-NCCS had delivered a lecture on “ Next Generation Sequencing” on 30/09/15 for MSc I students at MCC-NCCS. Dr. Santosh Sutar, Assistant Director/Assistant Professor, Yashvantrao Chavan School of Rural Development,Shivaji University, Kolhapur delivered two days lecture on “Non-parametric tests (Run test, Sign test, Wilcoxon’s signed Rank test, Mann-Whitney test) and its problem solving” on 05/09/15 and 06/09/15 for MSc I students at Microbiology, Dept, MCASC, GK. Dr. Navnath Kumbhar, IBB, on ‘Databases PDB, RASMOL and OMIM’, for MSc I students on 7/04/16 at Microbiology, Dept, MCASC, GK. Dr. Dheeraj Dhotre, and team, MCC-NCCS delivered a lecture on “Gene Annotation workshop” on 19/10/15 for MSc II students at MCC-NCCS. 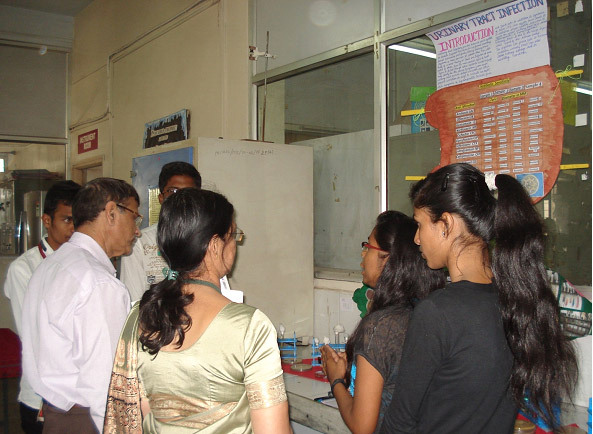 Dr. Leena Yeolekar, Consultant, Serum Institute of India Ltd., Pune demonstrated hands on experiments on “Egg Inoculation Technique” to MSc-I & T.Y.B.Sc. on 08/02/16 at Microbiology, Dept, MCASC, GK. MSc I students at Microbiology, Dept, MCASC, GK. “UDAAN” was initiated in the month of August 2010 for giving the students maximum exposure to the vast opportunities available in industries before they take a decision of their future career. Each student of M.Sc. II gathers and displays the complete profile of one of the leading industries in the field of Pharmaceuticals, Food and Dairy, Agriculture, Medical Diagnostics and Research. The details of the industry includes the leading brands of the company, complete product range, various manufacturing and R & D facilities, their contact details, market share and also the current career prospects in various departments. Staff members of the department have given financial support to students for their education. In Aug 2010, we have started a new activity of testing the Potability of drinking water available at our college, which is a basic need of everybody in the college. This activity is undertaken by T.Y.BSc. Microbiology students. 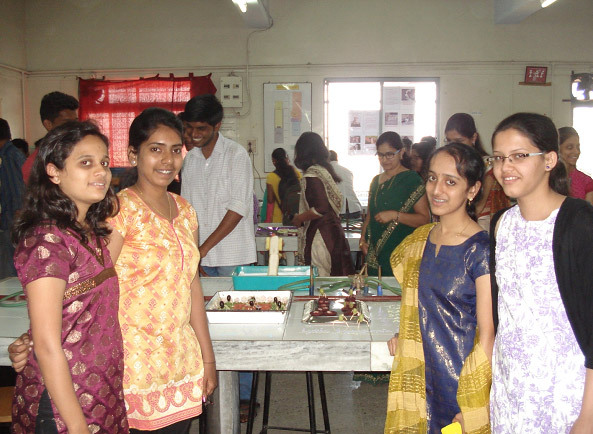 While participating in this activity the students get exposure to the applied aspects of topics included in their undergraduate syllabus and carry out some of the techniques which are commonly used in many water testing laboratories which are certified under BIS (Bureau of Indian Standards). 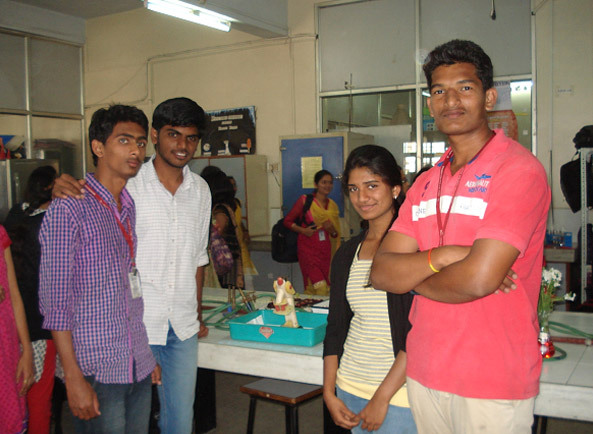 Participation of students in Annual Science Exhibition, ‘Anubhuti’: where projects, models and posters are presented. 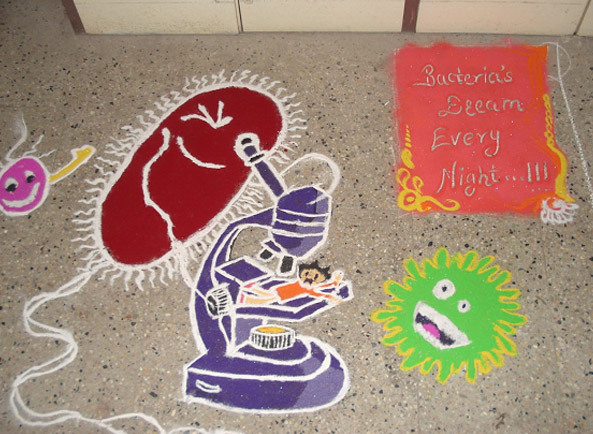 The department also organizes ‘Rangoli’ and ‘Salad Decoration Competitions’ with Microbiology as a theme. Participation of students in Annual Science Exhibition, 'Anubhuti' is encouraged where posters, models, project work undertaken are displayed. 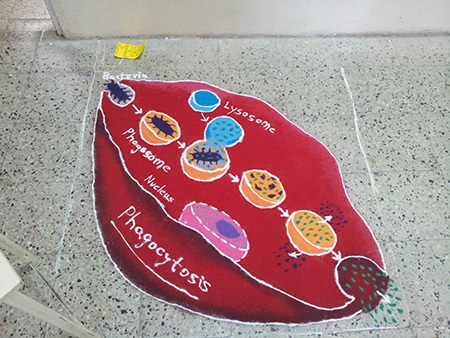 The department also organizes 'Rangoli' and 'Salad Decoration Competitions' with Microbiology as a theme. *Whitehead Institute for Biomedical Research, Cambridge, MA, USA. R.C. Garg Award for Best Paper in Indian Journal of Tuberculosis (2006-2007). First prize for poster at National Conference: ‘Dynamic Microbes: In Human Welfare’ organized by P.E. Society’s Modern College, Shivajinagar, Pune- 5 (Feb 2015). First prize for oral presentation at Third International Conference on Nanotechnology for Biological and Biomedical Applications (Nano-Bio-Med 2015), Indian Institute of Technology (IIT Bombay), Mumbai, India. First Prize for poster at National Conference on Faunal Diversity: Assessment and Conservation (FDAC-2016) at Modern College of Arts, Science and Commerce, Ganeshkhind, Pune on 22nd and 23rd January, 2016. 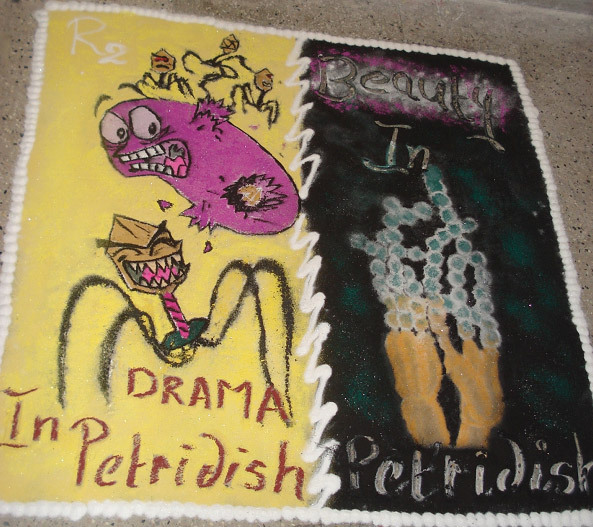 Consolation Prize for poster at 2nd Mini-symposium on Cell Biology, organized by NCCS, Pune (May 2016). Best poster award at 15th State Level Microbiological Contest and Microbio Olympiad organized by R. C. Patel College, Shirpur (2016). Symbiosis Institute of Management , Symbiosis International University, Lavale. International Institute of Management Studies (IIMS, Hinjewadi , Pune). Dnyneshwar Institute of Management And Research , Bavdhan. 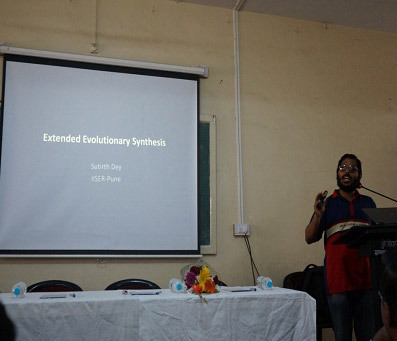 Dr. Sutirth Dey, Scientist (IISER-Pune): gave a talk on 'Extended Evolutionary Synthesis' for TYBSc & PG students of Life Science subjects. Students attentively listening to the talks. 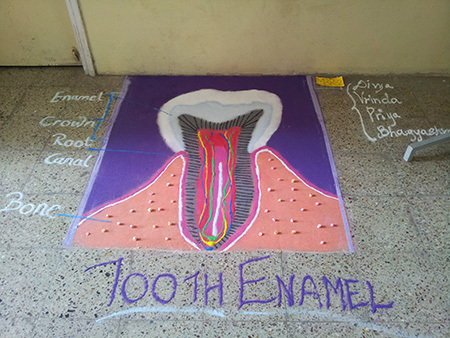 1st prize college level for project: Mouth Flora Of Pet Dogs, by Nikhil C. Kudale, Jaydeep Kshirsagar, Dhananjay Mukhekar, Rupali Lende S.Y.B.Sc Microbiology. 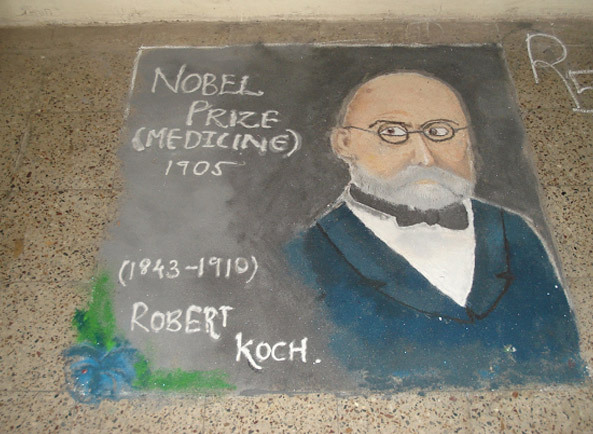 1st prize (dept level) for 'Robert Koch' by Mrunal Pardeshi, Sushmita Patra & Prajakta Tale of S.Y.B.Sc Microbiology. 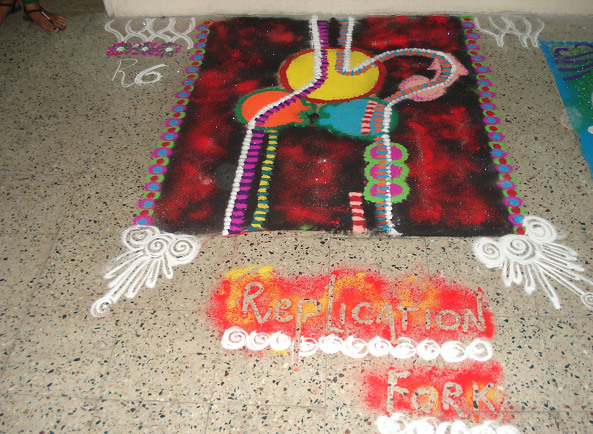 Replication fork depicted in Rangoli. 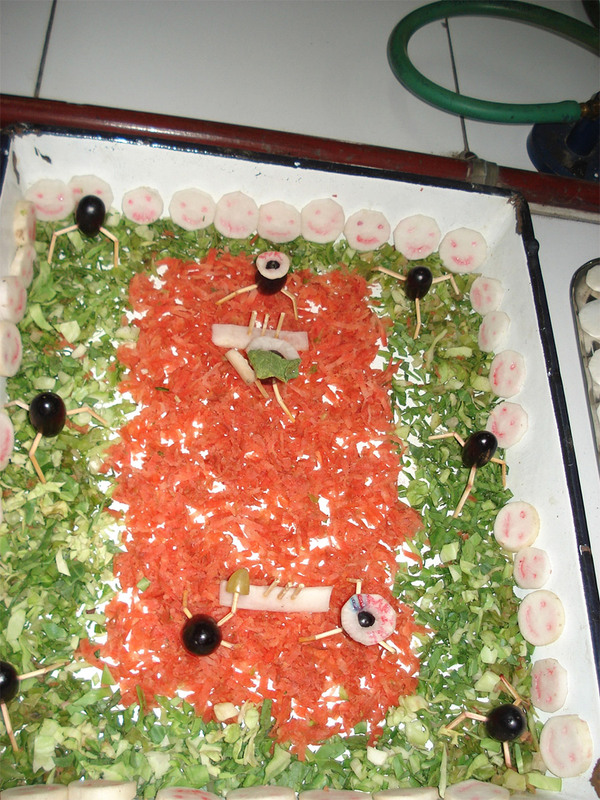 1st prize for Salad decoration: Lytic, Lysogeny cycle and Cricket Ground of Bacteriophage by T.Y.BSc Microbiology students: Deepali Kale, Gayatri Wad, Asavari Ranade & Apeksha Darshetkar.